Asian benchmark thermal coal prices were pegged at $85 a tonne on Thursday amid increasing gloom at industry's primary gathering. The $100 a tonne average in February this year now appears to have been a blip in a prolonged downturn. Newcastle FOB coal now averages prices last seen in November 2009 when the commodity was still recovering from post-financial crisis panic. Spurred by exploding demand in China the price of coal used in power-generation hit all-time record highs, averaging more than $190 in July 2008. But no-one at the 19th annual Coaltrans conference in Bali this week dared think back to hose heady days. Gabrielli, however, said he expects coal exporting countries, Australia, Colombia, Indonesia, Russia and South Africa, with the exception of the US, to continue to increase production despite current depressed international steam coal prices. In 2011 and 2012, there was an annual 100 million mt increase in seaborne thermal coal supply, Gabrielli added. 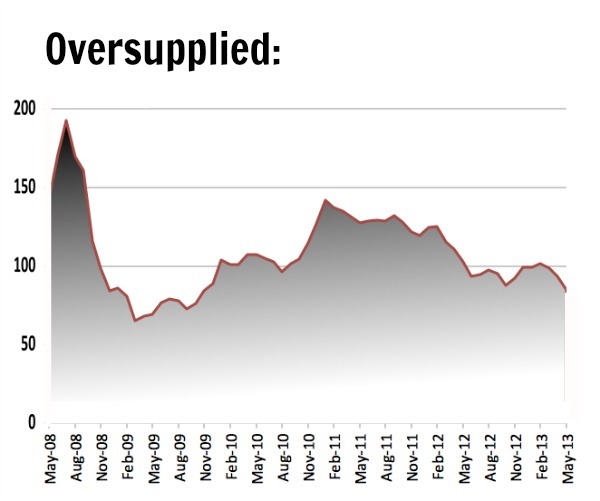 The 2012 coal story was not about weak demand but more about abundant coal supply, he explained. This unhealthy supply-demand situation – which would probably not be alleviated much by a Chinese proposal to ban low-calorific imports – was confirmed at the conference by the world's largest exporter of thermal coal, Indonesia. While initial estimates for domestic output was cut 2.5% to 390 million tonnes – some 350 million of which is exported every year – Bob Kamandanu, the chairman of the Indonesian Coal Mining Association, told Bloomberg overall this year production will expand by 3%, albeit down 7% in recent years. Coal exports from the Richards Bay coal terminal in South Africa increased by 6.5% during the first four months of 2013 compared with same period last year. Richard Bay coal was hovering just above $81 a tonne on Thursday, down some $12 since the start of the year. According to the Australian Coal Association, export growth of thermal coal last year was estimated at 10% to 162 million tonnes with growth through 2017 also in the double digits to total 271 million tonnes. The US is no slouch when it comes to growing exports either. According to the EIA, the country's exports grew more than 17% last year to 126 million tonnes, although this year and next exports should decline.